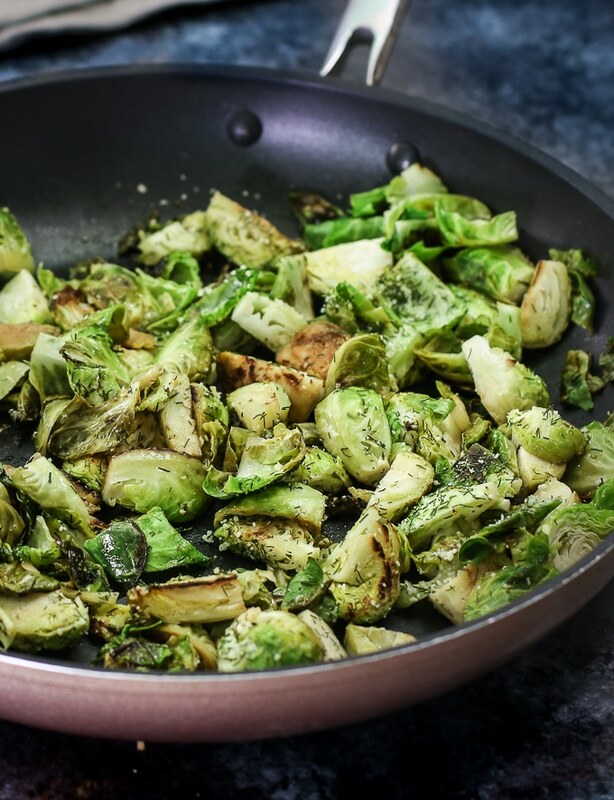 Need a quick & easy way to serve Brussels sprouts your family will love? 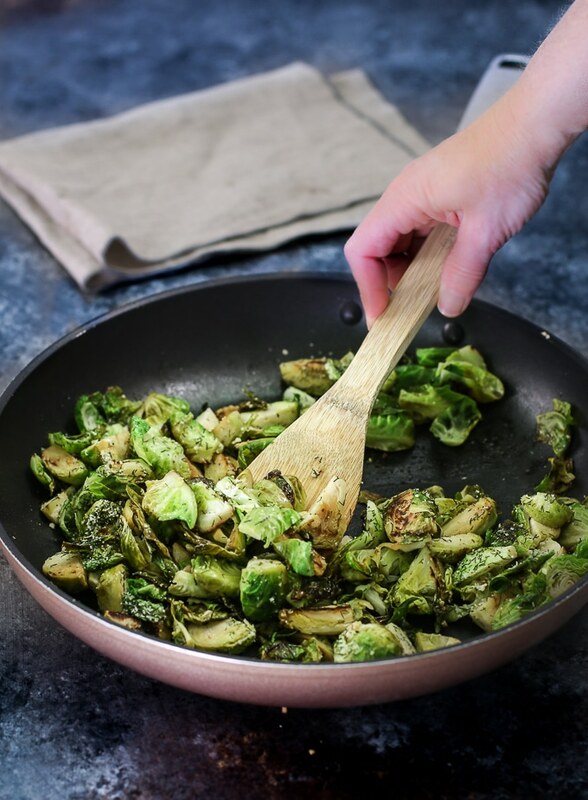 This Parmesan-Dill Sautéed Brussels Sprouts recipe is a hit! Are you ready for a status update on my new Freezer Meals strategy? I think I’ve *finally* found something that works for me. Here’s the thing — I love, in theory, the idea of doing a bunch of weekly food planning, shopping and prep on the weekends like my millennial friend and fellow RD blogger Lindsay of The Lean Green Bean. My life just DOES NOT seem to work out where weekends have any room for prepping meals for the week. Ultimately, I have no one to blame but myself. I mean, honestly, I don’t WANT to prep on the weekend. I cook A LOT during the week — testing recipes for Healthy Aperture, The Recipe ReDux, clients, sponsors, etc. The last thing I want to do on the weekend is put a lot of mental power into cooking. Don’t misread that I don’t want to cook. On the contrary — I want to make cinnamon rolls, pies, cookies… If it involves butter, flour, and sugar, count me in. But coming up with and executing a game plan for prepping meals for an entire week? No thanks. That’s why my new found affinity for freezer meals has been so handy. If I’ll just plan to prep ONE main dish each weekend, make a freak-ton (that’s the official measurement) of it and freeze it, I have a constant stash of entrees during the week at the ready. And sometimes those entrees are as simple as roasted pork tenderloin. Last week, I made four of them, wrapped ’em in foil and popped ’em into the freezer. I’d be lying if I said Brussels sprouts are universally accepted by EVERYONE at my table. But three out of four taste testers WILL typically eat them, so we usually have them at least once a week. (Around my house, those numbers constitute recipe success). I love them a few different ways — roasted with apples, served crisp in a salad and in the recipe I’m sharing today… sauteed with dill and parmesan cheese. No matter which way I eat them, I’m just glad to be eating them during the week and not prepping them on the weekend. I’ll leave that to my millennial friend. 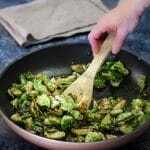 Add Brussels sprouts and saute just until crisp-tender (about 3 to 5 minutes); add vinegar and saute 1 additional minute. Sprinkle with remaining ingredients. Serve warm. Shared to FB! This recipe is right up my alley. 3-out-of-5 constitutes a win at our house! An I use frozen?! Do I need to thaw it?! I personally don’t care for frozen Brussels sprouts. I find the texture to be unappetizing. But you could certainly try!